The creation of a European Labour Authority, a debate on social priorities for the next Multiannual Financial Framework – the EU’s long-term draft budget – and discussions about the European Unemployment Insurance Scheme and decent work in the digital economy, were all on the agenda of today’s PES Social Europe Network meeting in Brussels. At the meeting the Network also expressed strong support for proposals for a European Child Guarantee to fight child poverty. More than one in four children throughout the European Union are at risk of living in poverty or experiencing social exclusion. 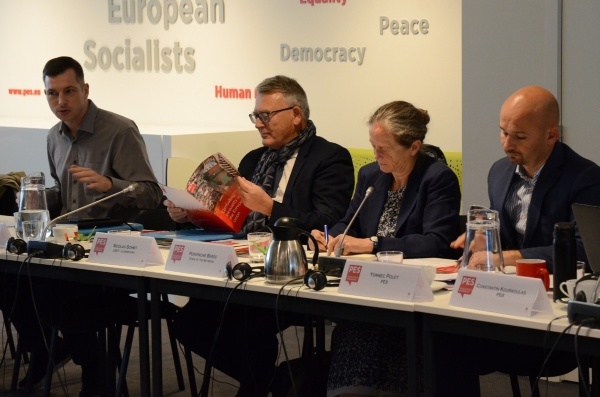 The Party of European Socialists and its partners from the civil society want to use the upcoming EU elections to push for the EU and national authorities to take action to end child poverty – one of the biggest injustices and root causes of inequalities in our societies. “Children today are at a greater risk of poverty or social exclusion than the overall population in a large majority of EU countries. Poverty has become an intergenerational problem – it is being carried over from one generation to the next. As a society, we cannot afford to waste this potential. All children deserve to have a fair chance.